What is World of Nintendo Micro Land and Why Am I Collecting It? 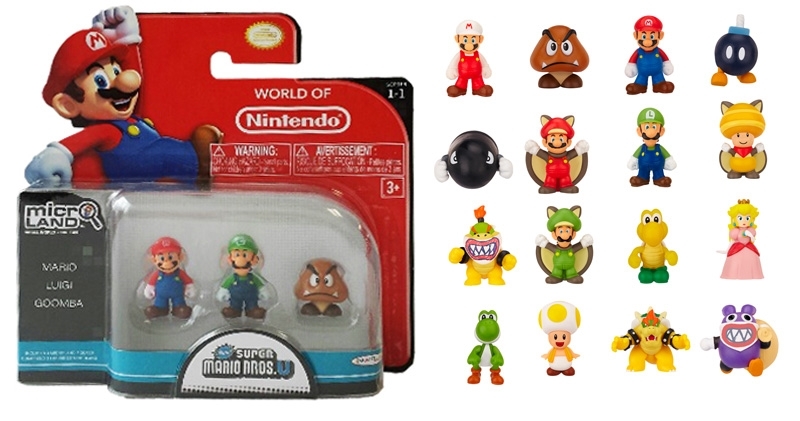 Starting in 2014, Jakks Pacific has released a number of Nintendo merchandise, including action figures, Mario Kart tracks, and Micro Land. I may discuss the action figures more in another editorial style article, but for now, let’s focus on Micro Land. As the name indicates, Micro Land are small Nintendo playsets that allow a lot of customization. So far, there are Mario and Zelda Micro Land sets available. The Mario sets have a neat gimmick. Each piece can form part of a level that you design to play with or display. Any fan of Mario games would find this idea incredibly appealing and have surely dreamed of designing their own Mario levels. While it is true that Mario Maker is on its way to the Wii U, seeing a tangible level that you put together holds a great appeal to Nintendo fans and collectors. These are just a few of the many World of Nintendo Action Figures. The Zelda sets are a little on the simple side (in my opinion) and represent key landmarks in Zelda Wind Waker. While both sets remind me of Micro Machines a series of toys which featured miniature cars, Star Wars, and Star Trek figures, the Zelda ones are especially like Micro Machines because they are simple and straightforward. You can’t really design a level with the Zelda sets or at least not yet. If you’re a fan of Wind Waker, they will make a great display. 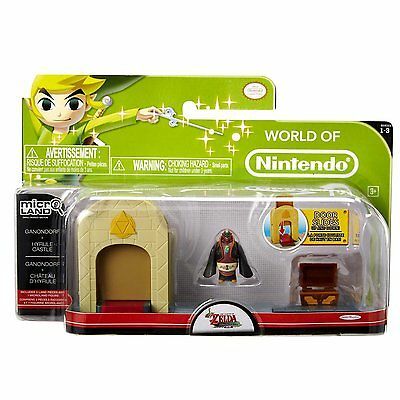 Zelda is the newest in the Micro Land line and seems to be hard to find and a little under the radar too. Micro Land is available in a couple of different types of products. The first are figure packs. These retail around $7 and come with three figures per pack. There are currently over 20 of these figures available. One thing to keep mind is that the paint quality on these figures is very inconsistent so if you’re looking to buy figures, you may want to avoid shopping online unless you can see the exact product you’re purchasing. The same applies for when you visit retail. There can be quite a few packs on store shelves with small to large paint flaws in them so it is worth looking them over before buying. The figures themselves seem to be the only thing that suffers from this fortunately. The Micro Land figures have a huge amount of variety and diehard fans will love seeing obscure characters in the small size. The second type of product is a smaller playset which costs $11 per set. These come with three tiles and two figures. Generally, the small playset has some unique gimmicks that aren’t available in the deluxe packs. Some themes (ice, grass, dessert, etc.) are only available in this product type. These sets may offer the best bang for their buck since they have a little of everything some unique play mechanics. The final type is the deluxe pack which comes with one figure, five tiles, and some power-up icons. The deluxe pack runs $18 and currently is only available in Acorn Plains and Layer Cake Desert. If you’re looking for tiles or are first starting out, a Deluxe set will get your level off to a great start and they are the only way to get power-ups. Looking closely at the options, it seems that Jakks has tried hard to make it so you will want to buy multiple products to get going. A deluxe set has a large amount of tiles but almost no figures to use. A regular play set has one or two characters and only three tiles so you don’t feel like you’re getting a full level. So if you’re planning to jump into World of Nintendo Micro Land, I would recommend getting a couple different sets at once to give you some display options (or play options if you would like). I will be reviewing some of the product soon so I will hold off on judging too closely for now, but I do want to talk about why I think this product is pretty cool. For one thing, I love the small scale of these figures. The figures themselves are about an inch tall and you can put together a number of tiles without taking up too much room. Of course, they are cute and charming to see at that size too. The tiles allow for a lot of customization because you can go 2D or 3D with them. You can also mix and match some of the themes like taking the grassy feel of Acorn Plains and adding some water levels. So there are a huge number of display options with these sets. These toys challenge your creativity in a way that other great toys like Legos do. What is perhaps coolest is just how many options there are for the World of Nintendo line. Jakks has mostly focused on New Super Mario U, but there are tons of Mario games to pull from and since they’ve already done Zelda, could we see Kirby or Metroid in the future? Maybe collectors could make their own Smash Bros. stage or show what Zelda and Mario would look like in the same game. The longer this line of toys goes, the cooler it is bound to get. 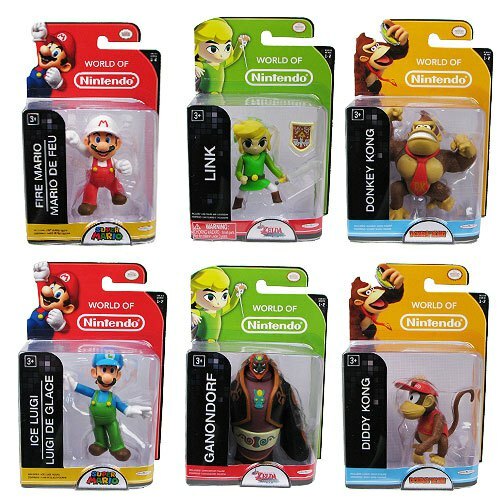 For these reasons, I am definitely collecting as many World of Nintendo Micro Land figures and at least some of the playsets. I am buying them to design levels, display them, and take some cool pictures. At this point, I haven’t decided if I will collect them all or just try to get ones that will help me build the coolest levels. They are decently priced, but what is keeping me from fully committing is how certain sets, like the ice themed ones only have two play sets. You cannot make a good level with only six ice tiles. This could easily be remedied later on and if there are any sets that don’t work for me, it is easy enough to skip them without feeling guilty. I hope this article helps you understand what these toys are about and why you might find them worth buying. This is the first of many articles on Micro Land and if you have suggestions for things you would like to see, please let me know in the comment section below or send me an email. 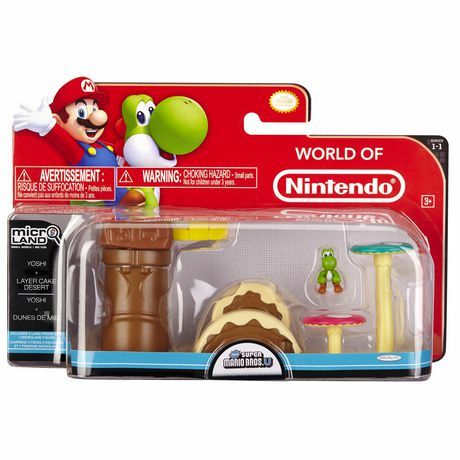 Previous Jakks Pacific World of Nintendo Micro Land is Coming!